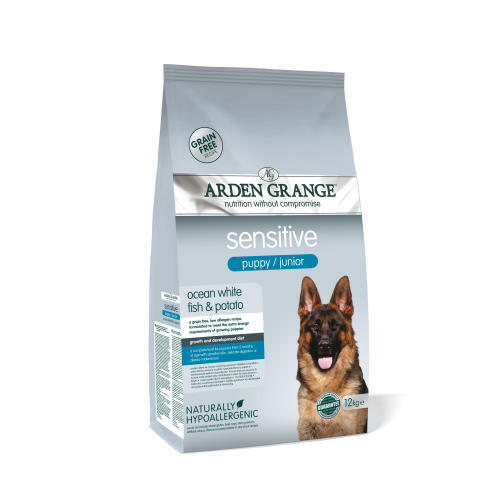 Arden Grange Sensitive Puppy Dry Dog Food is nutritious and scrummy! 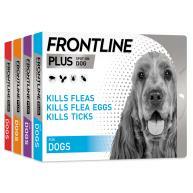 A complete, super premium pet food for puppies and adolescent dogs with particularly sensitive skin or digestion. This gentle recipe excludes grains and cereals, and contains ocean white fish as an easily digestible source of protein which is naturally high in omega-3 essential fatty acids. 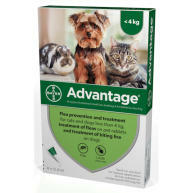 It supplies an optimal balance of vitamins and minerals to encourage steady, healthy growth and development. High quality ingredients are selected to create our diets, and we do not include any artificial colours, flavours or preservatives. 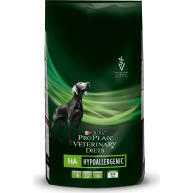 All our foods contain a unique blend of nutrients and natural supplements to help promote the optimum health, vitality and condition of your pet. 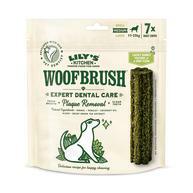 These include; prebiotics to aid digestion; joint supplements; essential fatty acids to help promote a healthy skin and coat; cranberries for urinary tract health; powerful natural antioxidants, plus added vitamins and minerals to help support your pet's immune system and dental health. All our products are naturally hypoallergenic as we do not use wheat, beef, soya or dairy products in any of our recipes. This may further reduce the risk of dietary intolerances and allergies that can cause digestive disorders and skin complaints. Analytical constituents: Crude Protein 29%, Fat Content 15%, Crude Ash 8%, Crude Fibres 2.5%, Calcium 1.6%, Phosphorous 1%, Omega-6 3.0%, Omega-3 2.9%. Composition: Fresh ocean white fish (23%), ocean white fish meal (18%), sweet potato (16%), potato (14%), refined chicken oil, potato protein, beet pulp, fish digest, whole egg powder, whole linseed, krill, yeast, minerals, prebiotic FOS, prebiotic MOS, yucca extract, glucosamine, MSM, chondroitin, cranberry, nucleotides, rosemary extract. Nutritional Additives: Vitamins: Vitamin A 21,000 IU, Vitamin D3 1,575 IU, Vitamin E 280 IU.